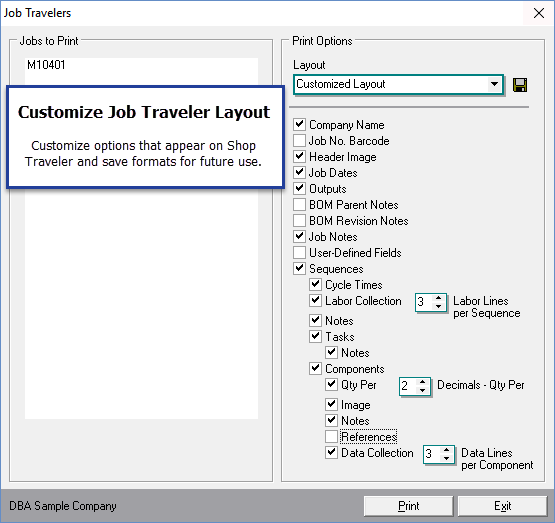 The job traveler provides your shop personnel with the manufacturing specifications needed to perform the job, including job header details, user-defined fields, outputs, sequences, tasks, components, and images. It is typically printed at time of job release and “travels” with the job as it progresses through the shop. Even though you can print job travelers from this menu option, we recommend that you print job travelers in the Job Control Panel screen as the more efficient alternative. In that screen you can print job travelers in a single batch for all jobs selected for release to production. You can print a traveler for one job, some jobs (from/thru range), or all jobs. If you select the some or all jobs options, additional selection options by job status and job type become visible in the panels below. This panel becomes visible when some or all jobs are selected in the Job No panel. You can use these checkboxes to filter the selected jobs by job status. ‘NEW’ status jobs are selected by default, but you can optionally include ‘RELEASED’, ‘FINISHED’, or ‘CLOSED’ status jobs. This panel becomes visible when some or all jobs are selected in the Job No panel. You can use these checkboxes to filter the selected jobs by job type. If you wish to save the current print settings to a new layout, select this option. You are prompted to enter the new layout name. If you modify a layout’s print settings and wish to save them, select this option. If you want this layout to be selected by default each time this screen is launched, select this option. Select this option to delete the layout. Use these checkboxes to determine which job detail elements are printed on the job traveler. 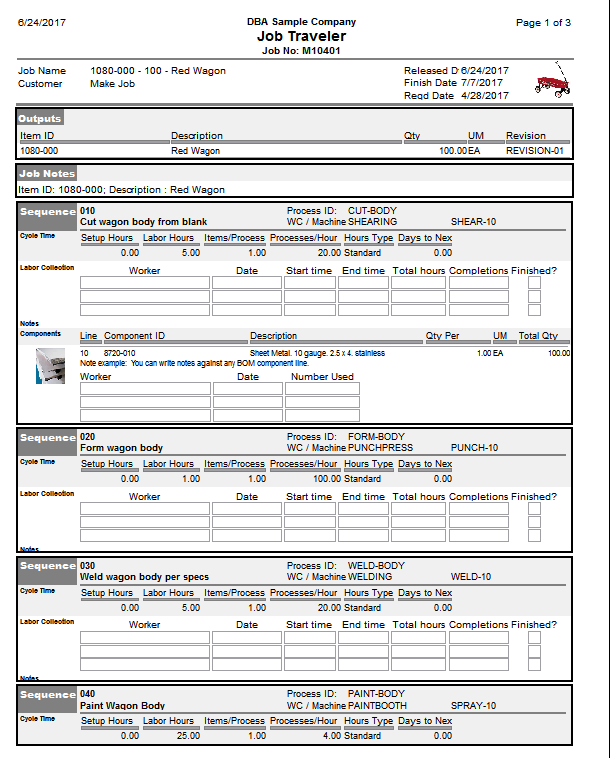 Print elements include a header image, user-defined fields, job notes, outputs, sequences, cycle times, sequence notes, tasks, task notes, components, quantity per, component image, component notes, and reference designators. You also can specify the number of decimal places to be printed for the output quantity, the component quantity per, and the component total quantity.